Dad will enjoy a 90-minute massage with heated stones to relieve knots and sore muscles. Designed to address the unique needs of a man’s hands and nails, the signature Gentleman’s Manicure completes the experience. Dad will feel like the “Man of the Hour” as he enjoys a 30-Minute Massage with a focus on the head, neck and shoulders followed by a Gentleman’s Fast Facial that is tailored to the specific needs of men’s skin. For dads in need of more serious grooming, Spa Sydell offers the Bad Boy package that includes a specially priced series of three chest wax services for $94.50 or three back wax services for just $116. This package will keep dad beach ready all summer long! For the sports enthusiast or workout fanatic dad, Spa Sydell is offering the Sports Dad package. Dads will experience a signature Athletic Performance Massage during which an expert massage therapist guides guests through a passive stretching series designed to encourage relaxation, increase flexibility and improve range of motion. 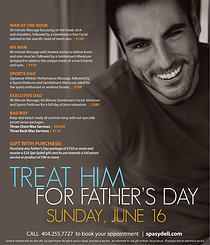 Following the massage, dads will enjoy a Sports Pedicure and Gentleman’s Manicure to complete the package. Dad will enjoy a day of pampering from head to toe without the frills as he experiences pure relaxation with a 90-minute massage and a 60-minute Gentleman’s Facial and Manicure as well as a Sport’s Pedicure.